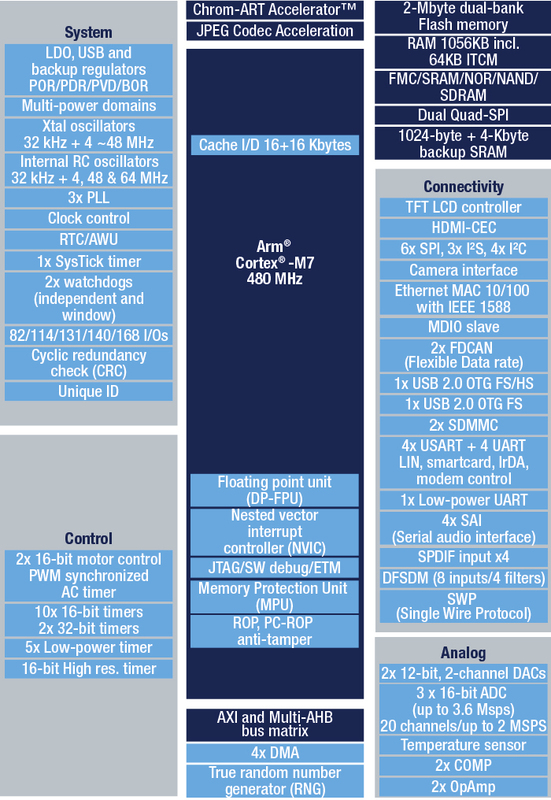 STM32H743xI devices are based on the high-performance Arm® Cortex®-M7 32-bit RISC core operating at up to 400 MHz. The Cortex® -M7 core features a floating point unit (FPU) which supports Arm® double-precision (IEEE 754 compliant) and single-precision data-processing instructions and data types. STM32H743xI devices support a full set of DSP instructions and a memory protection unit (MPU) to enhance application security. STM32H743xI devices incorporate high-speed embedded memories with a dual-bank Flash memory up to 2 Mbytes, 1 Mbyte of RAM (including 192 Kbytes of TCM RAM, 864 Kbytes of user SRAM and 4 Kbytes of backup SRAM), as well as an extensive range of enhanced I/Os and peripherals connected to APB buses, AHB buses, 2x32-bit multi-AHB bus matrix and a multi layer AXI interconnect supporting internal and external memory access.